Some of these fish are two Foot in Length. They are without Scales, of a dusky black on the Back, and of a pale Flesh Colour on the Belly. 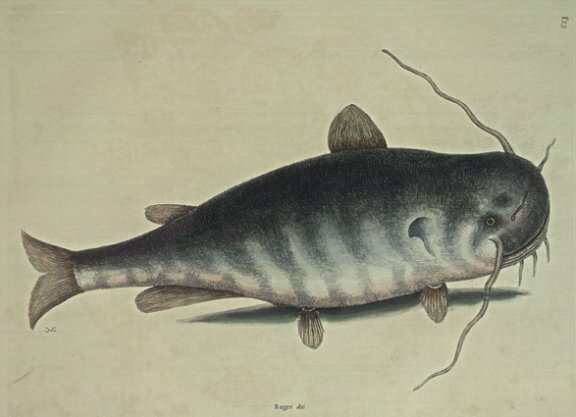 It had six Fins, one under each Gill, one on the Fore-part of the Back of a Conick form, between which and the Tail a smaller one; one under the Abdomen, and another between it and the Tail: The Tail small and forked, which with the Fins are of a dusky red Colour; the Eyes small, of a deep yellow or Gold Colour: From under each Eye shoots forth a very long fleshy Barb; before the Eyes grow likewise two more very small, and to the under Lip hang several more. Its Head is very large and rounding, with a very wide Mouth, capable of receiving a Fish as big as itfelf. They prey on their own kind as well as other kinds of Fifh, tho' their Teeth are very small; they frequent both fresh and salt Waters in most of the Rivers in the Northern Parts of America; their Flesh tastes like that of an Eel, and are accounted good eating Fish; There is another kind of this Fish, which has two long sharp Bones on each Side of the Jaws, which it can contract and extend in Defence of it self.